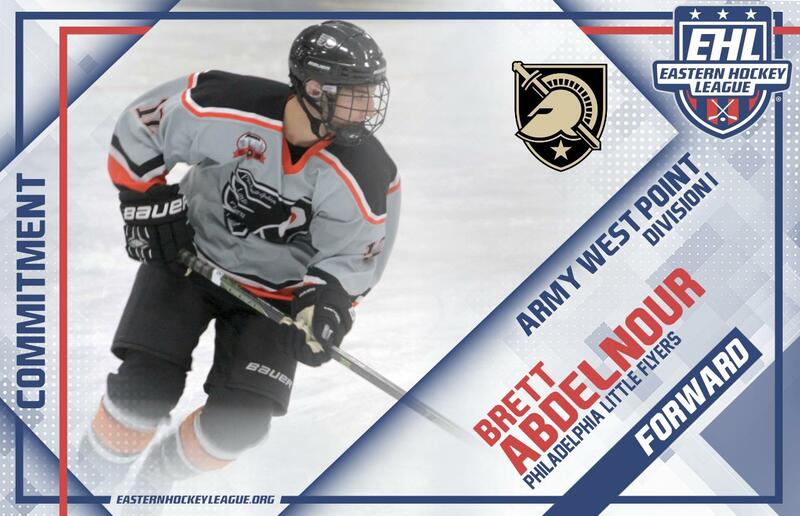 AMARILLO, TX -- Brett Abdelnour, an alumnus of the Philadelphia Little Flyers, has committed to Army West Point for the fall of 2019. The '98 is currently playing for the Amarillo Bulls in the North American Hockey League (NAHL), a team led by Rocky Russo (Head Coach) and George Lewis (Assistant Coach), who both used to serve as the bench boss for the Little Flyers. Russo was the 2016-17 EHL Coach of the Year, which was the season that Abdelnour spent in the Eastern Hockey League (EHL). The native of Macomb, MI played in 46 regular season games during the 2016-17 campaign, scoring eight goals and adding 13 assists, and two of Abdelnour’s tallies were game-winners. That postseason, which saw the Little Flyers fall to the Philadelphia Jr. Flyers in a five-game championship series, Abdelnour notched five points (one goal, four assists). In two seasons with the Bulls, Abdelnour has 58 points in 96 career games and was recently named an Assistant Captain for his team. While he has improved his skills in the NAHL, Abdelnour hasn't forgotten where he got his junior hockey career started. “The fact that both Pete [Alex Peterson] and I got our deals done is amazing and it proves that the EHL is a much better league than people give it credit for,” quote from Abdelnour on AmarailloBulls.com. As Abdelnour mentioned, he and Little Flyers' alum Alex Peterson have both made their Division I NCAA college commitments after developing in the EHL, and then continuing their way up the USA Hockey Ladder of Development.